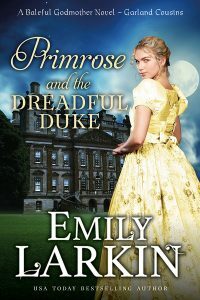 I love Emily Larkin’s Baleful Godmother series of historical romance with a magical twist so much that I leapt on the chance to read an advance copy of the latest in the series, Primrose and the Dreadful Duke. This was an excellent life choice because this book (the first in a subseries about the Garland cousins) combines so many of my favourite things: a believable romance with strong, textured characters, elegant writing, a lot of humour – and a murder mystery! The dreadful duke in question, Oliver Dasenby, is only dreadful because of how he so often plays the clown with his best friend’s sister, Primrose Garland. He’s smarter than he pretends. He’s also kind, loyal and spirited and, while flippant, he knows how and when to take things seriuosly, after eight years in the cavalry. He’s returned to England having inherited a dukedom and suddenly he has a new battlefield, where he’s a kind of prey for all the young ladies hoping to score a duke for a husband. Oliver is also slightly concerned about how he’s going to learn to be a duke after being a soldier. Primrose is intelligent, well-read, tart-tongued and good hearted, and her childhood friend often makes her laugh with his cheek and tomfoolery. Her faerie gift (one of the hallmarks of a Baleful Godmother novel) is incidental at the start, though later is useful as part of all the intrigues taking place. She’s quick-thinking too, observant and has a strong regard for the philosophies of the world’s most unlikely cupid, Marcus Aurelius. It’s a love story waiting to happen, but a few things might stand in the way. One is a duke-hunter who may be a bit of a harpy, and the other is that someone seems to be trying to murder Oliver. 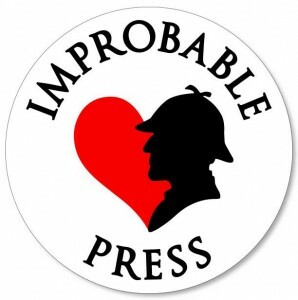 Primrose and the Dreadful Duke is light on its feet – charming and funny, full of personality and well-paced excitement and dangers from several dangerous directions. It balances light and dark, in tone as well in the supporting characters – and you can’t help but love Prim and Ollie as individuals and as they slowly work out how they really feel about each other – and solve a case of murderous intent. Add Primrose and the Dreadful Duke to your Goodreads list.